There are few summer pleasures more pure, more wholesome, or more in keeping with Wisconsin tradition than enjoying an ice cream cone on a hot day. We are, after all, the Dairy State. One of the stories my late father told about his childhood that I remember most vividly was about a nickel ice cream cone. Like the cone itself, it is a very simple story, which is perhaps what made it so memorable to me when, a half century later, I began asking a typical child’s questions about my father’s early life. When I was a child, the story illustrated to me the deprivations of my father’s childhood, perched on the edge of poverty as so many Americans were during that era. I could feel the disappointment of a child -- a Wisconsin dairy farm child, no less -- denied the most elemental of summer treats, which could very well have been made with milk from his family’s own Holsteins. In my imagination, a snow-white vanilla cone sparkled just out of reach. And, even in my youth, I could feel the disappointment – or perhaps even despair – that my grandfather likely felt having to reject the appeals of his two older children all because he lacked an extra dime. Money was undoubtedly tight, and just a couple of years later the family lost their farm to foreclosure. I imagined the ice cream cone story as one small illustration of what the family experienced during those years, when the aftermath of economic collapse and the harsh extremes of climate made the already precarious business of farming even more uncertain. In my imagination, the story was filed alongside apocalyptic newsreel footage of the Dust Bowl, Dorothea Lange photos of destitute Okies, and the despondent Joad family of Steinbeck’s The Grapes of Wrath. Now, so many years later, and in one of the first ice cream-eating seasons since my father’s death, I’m beginning to see this story quite differently. Perhaps the situation was exactly as I had assumed it was as a child. Or perhaps it wasn’t. The more I thought about it, the more the interpretations multiplied, moving from beyond the simple vanilla to mirror the innumerable flavors offered in a contemporary ice cream shop. The first inkling that my preconceptions had been wrong came when I read further along in the transcript of my interview with Dad. “I was really disappointed, but I’m sure I got over it,” he said with characteristic forthrightness, brushing aside the situation, as if what I had always assumed was a seminal experience had actually been little more than a long-remembered anecdote, caught in his memory like a stray bit of chocolate at the bottom of a sundae glass. “But I don’t remember any other hardships. We always had enough to eat,” he added. True, he had grown up without telephones or televisions, without indoor plumbing or electricity. Yet friends, neighbors, and extended family undoubtedly faced the same deprivations, which probably meant they hardly counted as deprivations at all. Now that I am the father of two ice-cream demanding children myself, another interpretation has appeared. Maybe the story had nothing to do with poverty. Maybe, just maybe, my grandfather did have an extra couple of nickels in his pocket. Maybe the milk check had just come or the creditors were in retreat that month. Maybe my grandfather simply hadn’t wanted to spend the money on this particular little luxury. 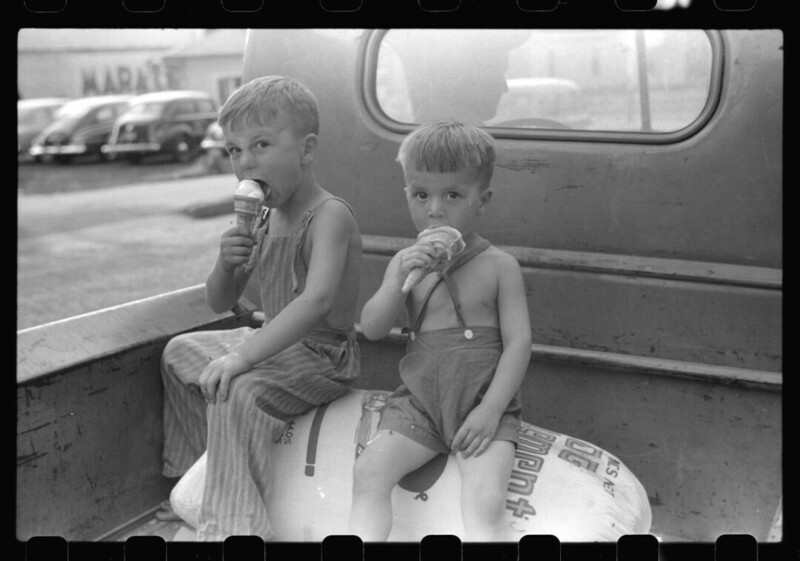 Maybe my dad and his sister had enjoyed ice cream on a previous trip into town while their toddler brother hadn’t. Maybe my father and his sister had quarreled and earned their father’s wrath. Maybe there just wasn’t time for ice cream. Much about fatherhood has changed since the early 20th century, but one thing I’m sure has remained constant is the tendency of children to make demands of their parents – reasonable or otherwise – at the most inopportune times. I will never get a conclusive answer to this question, and that doesn’t bother me. If I’ve learned anything from history, it’s that events can be subject to a multitude of interpretations, some conflicting, some overlapping. As a lifelong student of history – familial, regional, and national – my father no doubt learned the same lesson many times. Maybe, instead of a sepia-toned symbol of the struggles of a Depression-era farm family, this ice cream cone was simply a sweet treat denied on a hot day. To paraphrase the old joke about Freud, sometimes an ice cream cone is just an ice cream cone.